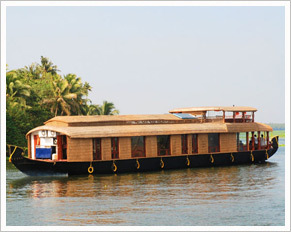 “Dream Boats" is a reliable name for backwaters rides in Kerala. Hundreds of foreign and domestic tourists, so far, experienced the charm of "Dream Boats". Kerala is an intricate web of land and water and cruising along its backwaters and lagoons in a house boat will indeed be an incredibly different and absorbing experience. 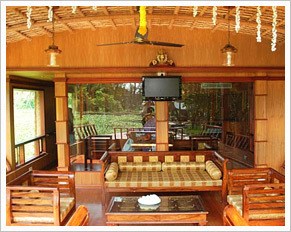 They take immense privilege in introducing ourselves as an emerging House Boat with its operations based right in Alappuzha, INDIA - "Gods Own Country" - Kerala. With great pleasure, they are proud to inform you that they can to cater to all your boats needs and assistance, to each and every clients in a very personalized and professional manner than any other tour operators in the region. "The Dream Boats" is managed by a group of professionals with profound experience in Tourism and travel for last one decade, having worked with leading companies in India. Hence, they can rightly claim, that they could cater to all your needs in every segment of the Boating services, they also assure that your needs are taken care by the best professionals in these field. They are all set to cater to House boats need of the esteemed guests with real professional touch; with tour packages to popular destinations of South India with the heady mix of unusual and usual accommodation, cultural activities and enchanting sightseeing trip to make your journey "a unique and memorable experience"..
Kettuvalloms or Houseboats (Riceboats) are country boats that were used in the early days for the transport of goods from the isolated interior villages to the towns. With the advent of roads, bridges and ferry services, gradually the kettuvalloms went off the scene. Now these kettuvalloms are back again as a major tourist attraction. A house boat is about 67 to 95 feet in length and has a width of around 13 feet to in the middle. The materials that go into the making are all local and Eco friendly bamboo poles, coconut fiber ropes, bamboo mats, coir carpets etc. The main wood used is "Anjili". The house boats have fully furnished single double triple and five bedrooms with sundeck, private balcony with comfortable chairs, kitchen and toilet with WC. In addition there is also separate rest room. Each houseboat has a three member crew - a chef, driver & cabin assistants. The cuisine is traditional Kerala flavor with the local specialties; delicious local fish. 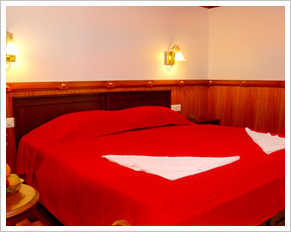 There are single bedroom houseboats for two people and two bedroom houseboats for four people. And 3 bedroom houseboat for 6 , and 5 bedroom houseboat for 10 People. The spectacular beauty of Kerala's backwaters needs no introduction. 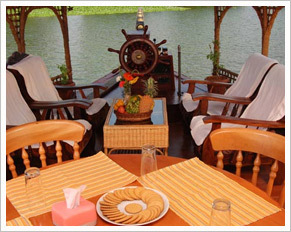 A cruise along the palm-fringed waterways of Kerala in a luxury houseboat is the most enchanting holiday experience in India today. In this world of simple pleasures, you will skim past ancient Chinese fishing nets, water lilies, lush paddy fields, coir villages, rustic homes, temples and coconut groves. A guided tour down the backwaters would provide you with a complete and most enchanting experience on the back waters of Kerala and will also reveal to you some interesting facts about the life of local village people. This month's lens view takes you to the backwater stretch of the Vembanad, where one can go for a leisurely cruise on a multi deck boat, allowing you enjoy the scenic backwater life. Bed Rooms: Cozy spacious and comfortable with windows opening to the beauty of life outside. 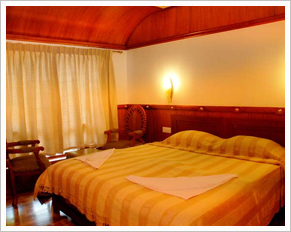 Bamboo curtains at windows ensures privacy besides, the bedrooms have electrical lightings and fans. Most of our houseboats have A/c rooms. Living Rooms: It’s an open air space with a sun deck. Sitting on the carved wooden chairs. You can enjoy the beauty of surroundings. 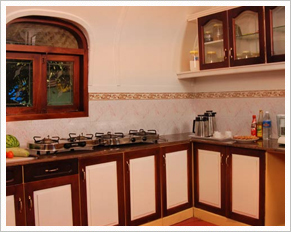 Kitchen: A clean, well-planned place that assures you tongues tickling Kerala Cuisines. Here our chef prepares the traditional veg. and non veg. dishes of Kerala. 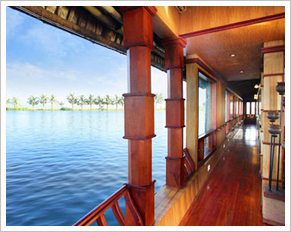 Upper Deck: It gives an advantage to have a better view of backwaters. Moreover you can feel the extra privacy attached with sun deck. 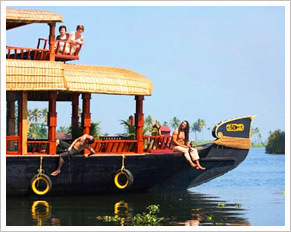 www.Kerala.com www.Alappuzha.com www.Keralatravels.com Powered By Worldviewer Dot Com (India) Pvt. Ltd.